Does Malachi have a message for us today? Even though listed among the Minor Prophets, this book has major lessons and warnings for Christians of all times. You may be surprised to discover that the subject matter in the Old Testament book of Malachi has significant implications for your life now and for your future. 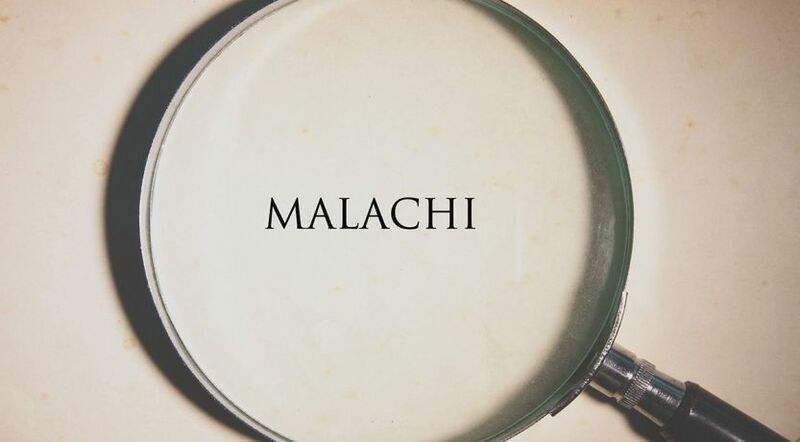 Where does Malachi fit into the Bible? Malachi is the final book of the 12 Minor Prophets, which the Jewish scholars viewed as one book although recorded by 12 different scribes over a period of perhaps 350 years. These 12 books are called minor not because they are less inspired or of less importance, but because the prophecies are shorter. The Bible shows that because of their sins, the tribe of Judah was taken into captivity by the Babylonians, with Jerusalem and the temple being destroyed in 586 B.C. A remnant of the Jews returned from that captivity and, during the time of the prophets Haggai and Zechariah, finished rebuilding the temple (520-516 B.C.). After another 60 years Ezra arrived to further advance the nation. He was followed 13 years later by Nehemiah who rebuilt the walls of Jerusalem. By Malachi’s time, the Jews had been back in their homeland for more than 100 years. The temple had been rebuilt and the city of Jerusalem had been restored. Malachi means “messenger,” and it is translated as “My messenger” in Malachi 3:1. The obvious implication is that Malachi is God’s messenger with a message from Him. Nothing else is mentioned or known about the author. First, the prophet Malachi was one of the messengers. The priests were supposed to be God’s messengers, but were chided for failing to perform their priestly office according to God’s instructions (2:7). John the Baptist was to prepare the way for Jesus Christ’s first coming (3:1). Jesus Christ is the Messenger of the covenant who would return to His spiritual temple, the Church (3:1). An end-time Elijah is prophesied to appear on the scene before “the great and dreadful day of the LORD” (4:5-6) to prepare the way for Christ’s second coming. At the time of Malachi’s writing, the spiritual condition of the people was deplorable and wretched. Some had wanted to scale back on their worship of God. Others were highly skeptical of the worth of worshipping at all. As you read through Malachi, you will be struck by the prevalent sins of the day: adultery, lying, oppression of the poor, ungodly marriages, stealing God’s tithes and offerings, sacrifices that were inferior, a lax priesthood and so on. Malachi prophesied to a nation that had reached a low spiritual condition. They had a casual approach to the worship of God, and the priests were responsible for not giving proper spiritual direction and guidance. An important aspect of the book is the people’s failure to recognize God’s love for them (1:2). Instead they became indifferent and calloused in seeking God, and they were unwilling to heed the dire warnings and predictions. There was a spirit of confrontation and argumentation between the people and God, including God’s messengers. Their spiritual laxity bred a defiant, contentious attitude that would lead to their destruction unless repented of (4:6). We have to ask ourselves if these conditions characterize the prevalent spiritual condition of the Christian world today. It should not stretch our imagination to see similar behavioral trends in vogue, especially among people of the Western world. We claim to be “Christian,” but are indifferent and calloused toward God and His inspired Word—His revelation to man. Few take notice of biblical teachings and how they apply to their daily lives. Malachi was inspired to carry his message forward to the end of the age, and he makes reference to the return of Christ (1:11; 3:1-6, 16-18; 4:1-6). He calls it “the day” (3:2, 17; 4:1, 3, 5). Out of love, God calls for us to repent; and He gives a stern warning to all, including those living at the end time. It behoves all people to heed the warnings so that they will be “worthy to escape all these things that will come to pass, and to stand before the Son of Man” (Luke 21:36). Unless Christ intervenes in the affairs of humanity, the world would end “with a curse” or utter destruction (Malachi 4:6; see also Matthew 24:22). The whole process that eventually leads to the lake of fire (Malachi 4:1) begins with the people not responding to the love of God (1:2-3). They “feared the LORD”—honored, esteemed, respected and obeyed Him. They “spoke to one another,” showing the importance of fellowshipping with people of like mind. They “meditate on His name”—study and think about the Bible to come to a greater understanding of God and His purpose for mankind. Their lives took on a different purpose and meaning. Hope replaced despair, and truth replaced error. They served Him, showing a willingness to obey God and to seek His Kingdom and righteousness as a first priority in their lives (Matthew 6:33). The book of remembrance is mentioned as an encouragement to those faithful to God, since He needs no book of records to remember or recollect names. Israel shows disrespect for God’s love (1:1-5), and yet He continues to be patient with them. The people display disdain and lack of respect for God (1:6-14). God lays the blame at the feet of the priests who were supposed to teach them His ways. They were allowing the people to offer blemished sacrifices (1:13) in direct opposition to God’s instructions (Leviticus 1:3; Deuteronomy 15:21). Even human leaders would not accept such offerings (Malachi 1:8)! Those called to serve in the ministry must be diligent in setting the right personal example while teaching God’s Word faithfully. The message for us is that we should give our best to God. Even though there are no animal sacrifices today, each of us should be a “living sacrifice” and our service must be “acceptable to God” (Romans 12:1). Do we approach our religious observances in a careless, casual manner? It is up to us to fulfill our Christian responsibilities in a way that is pleasing to our Creator, unlike the people of Malachi’s time. “And now, O priests, this commandment is for you” (2:1). God continues to berate the priests for their negligence and disregard for His commandments (2:1-9). Unless they repent, He pronounces a curse upon them (2:2). As a “messenger of the LORD of hosts” (2:7), a priest should not mislead the people into falsehood and error: “‘But you have departed from the way; you have caused many to stumble at the law. You have corrupted the covenant of Levi,’ says the LORD of Hosts” (2:8). This is a serious indictment against the priests who were responsible for correctly teaching the proper worship of God. Malachi 2:10-13 is a warning against the introduction of idolatry and paganism into their worship. Even when they had an outward show of repentance, it was false and hypocritical (2:13). Verses 14-17 describe a disregard for the importance and sanctity of marriage. Unfaithfulness leads to treachery and unstable families, which, in turn, leads to an unstable society. It is sobering to realize that God “was a witness at your marriage in youth to the wife with whom you have now broken faith—though she is your mate and lawful wife. Not one of you has any trace of moral sense … for I detest divorce and cruelty to a wife” (2:14-16, Moffatt translation). Twice the prophet says “take heed to your spirit” (2:15-16). Unfaithfulness in marriage often begins with wrong thoughts and unsound impulses centered in the mind. Malachi 3:1-6 mentions the Messenger who will bring hope and comfort to a distressed world. But the question is asked, “Who can endure the day of His coming? And who can stand when He appears?” (3:2). The time before the return of Christ will bring about huge and calamitous events that will stun the world (Joel 2:11; Revelation 6:17). However, Christ in His mercy will return to establish a new society based on His laws and way of life (Malachi 3:4-5). As loving as ever, God calls for repentance, but the people don’t see the need (3:7). Verses 8-15 deal with robbing God of tithes and offerings that rightly belong to Him. The people don’t seem to understand or care that their actions are a direct violation of the Eighth Commandment, “You shall not steal” (Exodus 20:15). God challenges them to put Him to the test (Malachi 3:10). If they would be willing to abide by His financial laws, He would demonstrate His faithfulness to bless them individually and as a nation (3:10-12). Verses 16-18 make a distinction between the wicked and the righteous. Here God refers to those who are faithful to Him as His jewels or special treasure. The book of remembrance is most likely a reference to the Book of Life mentioned in the Bible (Philippians 4:3; Revelation 3:5; 13:8). In the last chapter of Malachi there is a description of what will occur to the incorrigibly wicked in their day of judgment. These are the people who deliberately persist in rejecting God’s laws and His way of life. Notice they are ashes under the feet of the righteous, and not in perpetual torment in a fire that never goes out (4:1, 3). The righteous who have remained faithful and endured to the end (Matthew 24:13) will be given blessings beyond imagination (Romans 8:18). As a last admonition, God calls upon all to “remember the Law of Moses, My servant, which I commanded him in Horeb for all Israel, with the statutes and judgments” (Malachi 4:4). This is the final instruction in the last book in the English arrangement of the Old Testament books. It ties in with the first book in the New Testament and Christ’s teachings that He did not come to destroy the law (Matthew 5:17-19), but to make it more complete. It is a direct contrast to many who teach that the law is irrelevant and has no bearing on the life of a Christian. In verses 5-6 there is a reference to an Elijah who would come to prepare the way before Christ’s second coming at the time of “the great and dreadful day of the LORD.” John the Baptist partially fulfilled this prophecy, preparing the way for Christ’s first coming. The instruction in Malachi is clear. God pleads with people to consider their ways and to respond to His love and to accept His offer of everlasting life (John 3:16). He desires that all come to repentance in order to be saved (1 Timothy 2:4; 2 Peter 3:9). God in His great love and mercy wants us to reap the benefits and rich rewards that await those who genuinely seek and obey Him (1 Corinthians 2:9). Each of us should study His Word, the Bible, and make its teachings part of our daily lives. Life will take on a new and exciting dimension never experienced before. The Bible is our anchor in an increasingly unstable and dangerous world. It is the only source of real hope among the uncertainties that daily confront us. Keep studying and applying its words, and let us know if you have any questions or if we can serve you in any way. For a quick link to all the other books of the Bible, see “Books of the Bible” on the Learning Center.